The paperback cookbook can be bought on Createspace or Amazon at below links. Its a bit steep at Rs1600/$25 but that is how expensive a full color cookbook is when self-published! 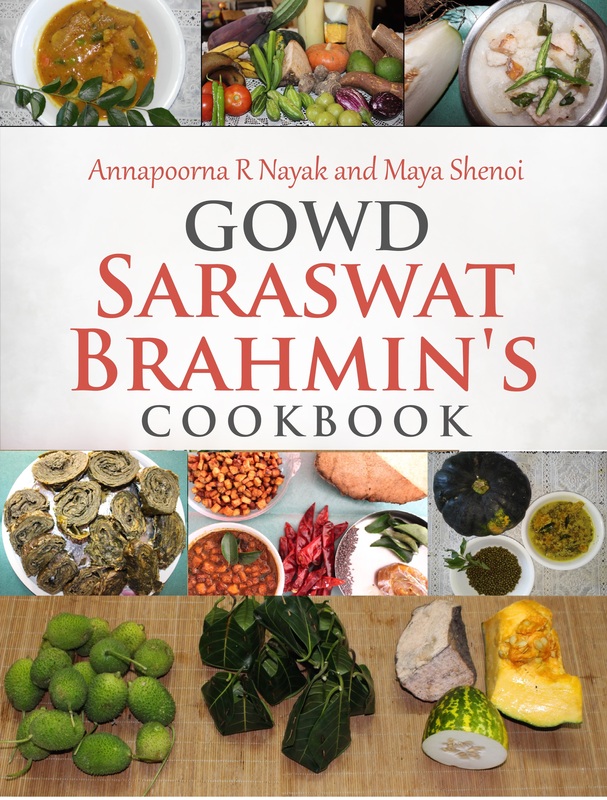 If you thought ghassi, sambhar and idlis summed up the cuisine of the Gowd Saraswat Brahmins (GSB), you are quite mistaken. The food cooked in a Brahmin home is essentially sathvic paying special attention to the balance and nutritive value of the dishes prepared. Simple lentil soup, ‘dhali toy’, served over the steamed rice and the topping of a dollop of homemade clarified butter/ghee is a probably the one most loved comfort food for GSBs. There are complex curries like ‘val-val’, spicy ‘teeksani ummans’ and slightly sweet ‘ambe sassam’. You would see variety of plain and spicy food in a meal that is balanced with a glass full of thin curds, ‘taak’ as a final course to set right any imbalance in the food eaten for the day. Even though GSB cuisine comes from spice rich regions of Karnataka and Kerala, we see very limited palette of spices being used, yet, it lacks nothing in terms of taste and deep digestive philosophies relevant to food. The cuisine revolves around mustard seeds, cumin seeds, curry leaves, chillies and turmeric. Ginger as a digestive aid, Green leaves of all kinds as high fibre source, dried lentils and beans as nature’s tiny capsules of proteins, turmeric as healer of wounds and sundry health issues, asafoetida for controlling gastric problem; every ingredient used in the GSB cuisine has a purpose that goes beyond taste and texture. There are fifty-six select vegetarian recipes in this book which showcase the wide variety and infinite inventiveness of the GSB kitchen. Lesser-known dishes, featuring specific types of vegetables or leaves, an awesome array of chutneys and pickles, and delightful sweets without which no meal can be complete, are also lovingly included. The book starts with the history and culture of the GSBs. This book is a much-needed addition to the library of any discerning gourmet or anyone with an interest in diverse cuisine and culture of India.